The Famine Early Warning Network warned last week that the current rainy season in the eastern Horn of Africa will not be adequate to prevent food insecurity in the region still recovering for last year’s devastating famine. Learning lessons from what did and did not work in the 2011 famine relief efforts in Somalia is thus a matter of urgent and immediate concern. A new field dispatch by the Enough Project illustrates how, on the most local level, deficiencies of the relief effort played out, based on research conducted in the Somali capital of Mogadishu. Communities across Somalia, Ethiopia, and Kenya suffered severely from the 2011 drought and famine; tens of thousands of people died. Somalia was the epicenter of this human tragedy, largely because conflict and the severe policies of the militant group al-Shabaab undercut the traditional coping strategies Somalis use to deal with extreme weather and also cut off these vulnerable communities from humanitarian aid. The relief effort in Mogadishu suffered from lack of access and ongoing insecurity, but unlike in most other parts of the country, Somalia’s Transitional Federal Government, or TFG, had unparalleled control there. And yet the city was mired in some of the most acute suffering, and famine was persistent, even as the United Nations rolled back the famine classification for other Somali regions. 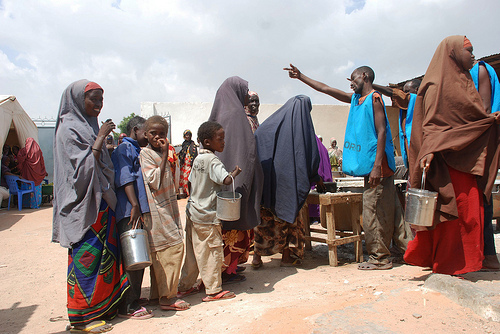 "[I]nsecurity, inadequate oversight for distribution of humanitarian assistance, and wholesale criminality combined to create a situation where beneficiaries often didn’t see the relief intended for them, security services involved in distribution committed abuses with impunity, and aid flowed instead into the pockets of corrupt Somali officials—all issues that primarily fall to the TFG to address." The field dispatch, “Somalia Famine Relief: A View from Mogadishu,” presents individual testimonies from displaced people, highlights some important details about the scope of the suffering in Mogadishu, and features the Somali prime minister’s startling denial of famine in the city, just a day before the U.N. announced a massive new appeal for funds.